Being a long time fan of SEOMoz (now Moz), I was honored to be invited to give a Mozinar and share my knowledge of Google Plus with the passionate Moz community. 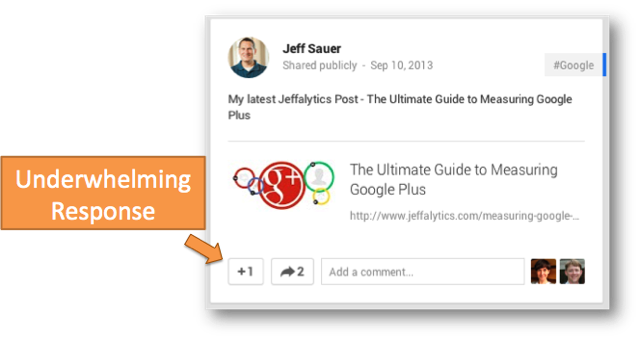 As the #1 social media traffic source for Jeffalytics, Google Plus has had a major role in putting this site on the map. 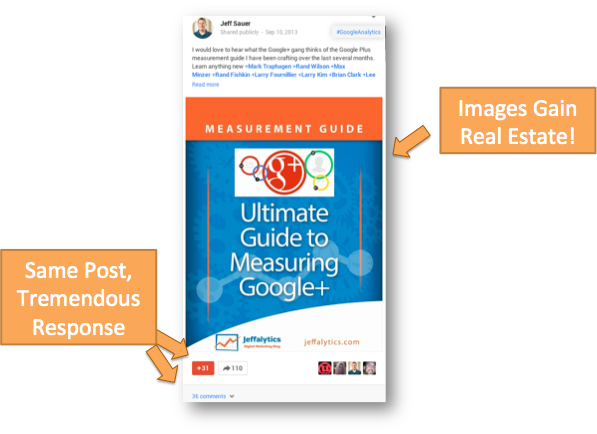 You could say that much of the success achieved by Jeffalytics is due to Google+, so I was excited to lead a webinar where I could share many of the lessons that I have learned along the way. With the quality of content normally put out by the folks who contribute to Moz, I knew that the presentation needed to deliver on many levels. We needed to go much further than “Google+ is important” and help viewers understand how they can use the network to be successful. By sharing examples of the most successful Google Plus users and mixing in my own experiences, I was able to come up with an 89 slide presentation and deliver a 90 minute webinar to 500+ Moz fans. 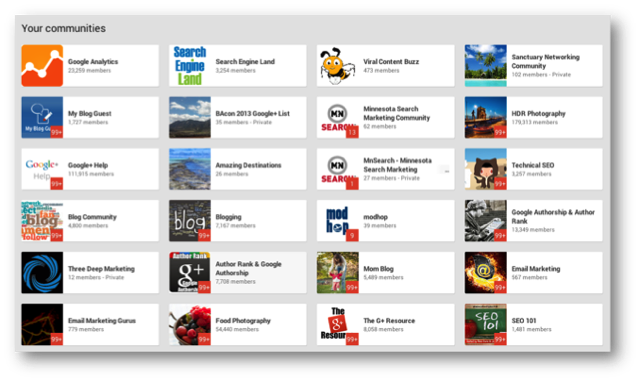 For those of you who were not able to attend, you can learn all about Google plus with the resources below. If you are an audio/visual learner, your best bet is watching a recording of my Mozinar hosted over at Moz.com. The presentation itself is around 80 minutes long and then there are 10 minutes of questions at the end. If 90 minutes seems like too long, I have embedded the full presentation below, and you can also review it on Slideshare. For those of you who prefer to read a summary of what was discussed, the rest of this post is for you. Earlier this year, Google+ surpassed Twitter to become the social network with the second most active users. While many people discount the Google+ user numbers based on their own personal biases, the reality is that these are real people who are using the network. 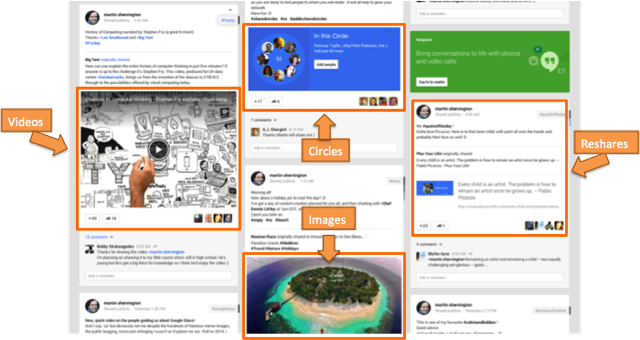 As Google works to further integrate Google+ into the entire Google experience, we can only expect people to become more engaged with the network. 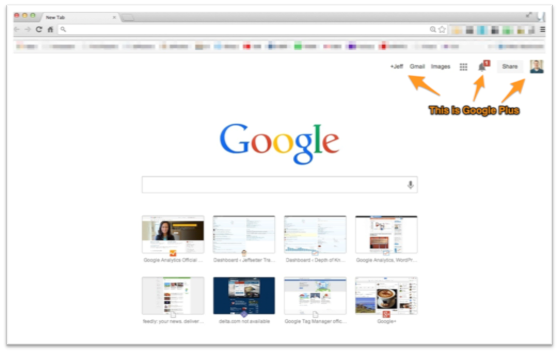 Have you noticed lately that when you are logged into Chrome that your Google Plus profile is highlighted? What about when you log into YouTube? 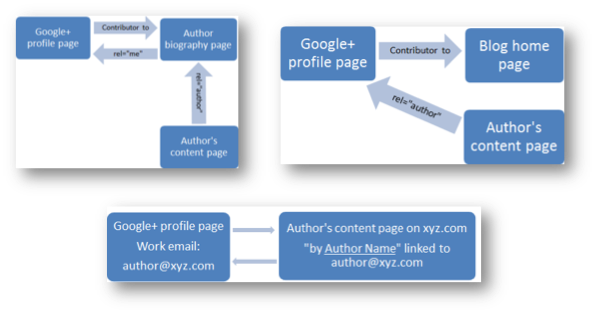 You get the picture, Google Plus is more than just a social network, it’s the connective tissue between all Google properties. Just how big are Google properties? HUGE – reaching just short of 200 Million US web visitors a month. For those people who use Google Plus – hundreds of millions of people in the US alone – you have provided Google with information about you that may be used for any number of reasons. It can be positive for marketers to share where they contribute content, what they are interested in and the topics where they have expertise and authority. On the other hand, this information may be used to fine tune the way you receive advertising, identify areas of unscrupulous behavior and simply to better understand more about the people who visit their websites. One of the biggest complaints that I see from people is that nobody they know uses Google Plus, so why should they use it themselves? To me the answer is simple: make new friends! There are literally hundreds of thousands of people sharing interesting information on Google Plus every day. They are generally very friendly and helpful to new users, making it a great place to meet new people. A good way to get started is through shared circles, which I will discuss later in this post. This may sound obvious, but one of the biggest mistakes marketers make is not sharing their great content with Google Plus. It could be because they rarely use the network themselves, or they may have simply forgotten. 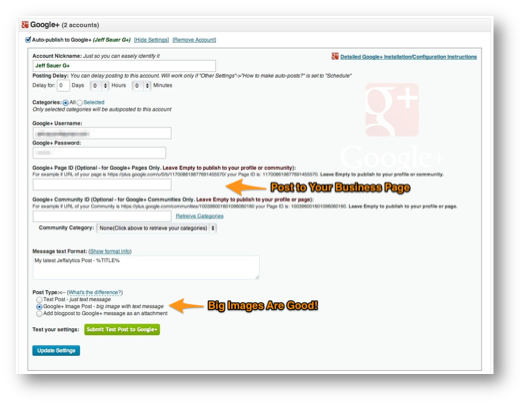 At Jeffalytics, what I have done is installed a plugin called SNAP that allows me to post automatically to Google+ each time I have new content. One of the best ways to make new friends on Google Plus is to share the content of other people and mention them in your post. An example of someone who is doing a fantastic job at this is +Martin Shervington, who is a true pro at sharing content on Google Plus. He constantly shares videos, images, circles and posts from friends. Knowing the strengths and weaknesses of a network helps you become more informed with how to properly harness the power within. 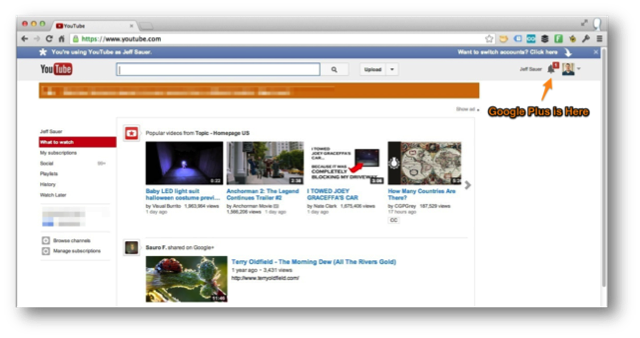 Google Plus excels in images, videos, circles, communities and hangouts. Tailor your content strategy to these strengths and you can drive all kinds of engagement to your profile and traffic to your website. For some in depth Google Plus Content Strategies, I recommend this post from +Copyblogger. I posted the same article within minutes of each other using two different methods of publishing and each received drastically different results. The first image was shared as a URL and Google crawled the page to pull out an image. This post had very little reaction from my followers. Minutes later I posted a link to the same page as an image post with a link embedded and saw significantly more engagement. My theory is that images take up more screen real estate and are more compelling to visitors. In order to test whether my image posting success was a fluke or commonplace, I looked over profiles of other Google Plus users and noticed a pattern: they use images in most of their posts! Here are posts from +Rebekah Radice and +Cyrus Shepard that illustrate the point. One thing that I learned in the process of using images for posts is that you can learn how many people viewed your image by looking over your image information. Embedded in the image information on Google Plus is a count of how many times it was viewed. Awesome! There are tens of thousands of people just like you on Google Plus! 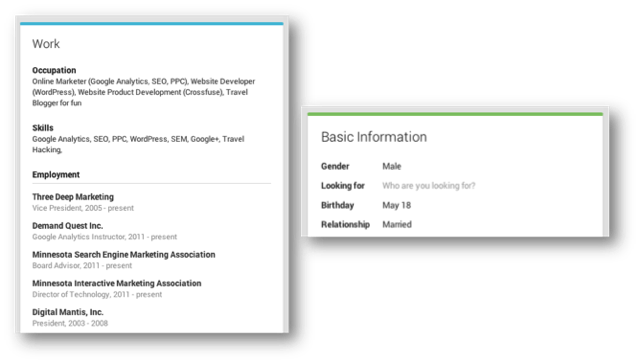 The easiest way to find them is often by leveraging the communities feature and meeting people with common interests. I have joined many communities in the past and found that they are a great way to discover new content, meet new people and even share your content when it is relevant. 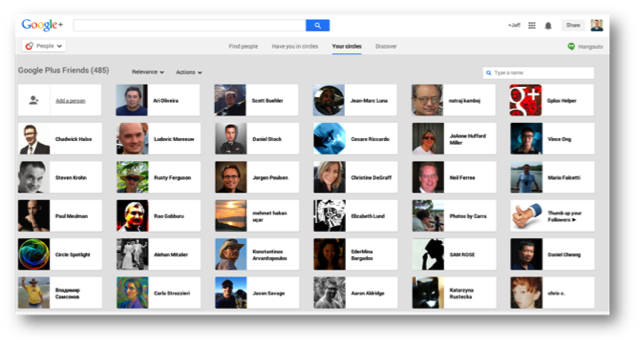 If you have an interest, chances are there is a community on G+. While I find communities to be really helpful, I must admit that I have never gone back to 90% of the communities I have joined. Without some sort of proactive notification about activity in the community, I just forget to go and check out what’s new. For the communities that I want to interact with the most, I have started to turn on notifications for whenever something new is posted. Just beware of notification overload. 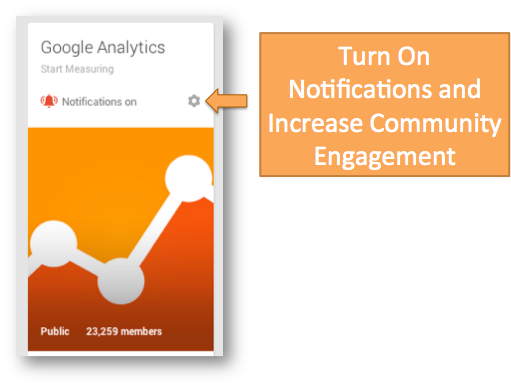 When you sign up for notifications, you may find that you have 10-20 extra emails a day in your inbox. 12) Can’t Find a Community? Start Your Own! One of my hobbies is travel blogging, so I wanted to share some of my awesome posts about visiting exotic destinations all over the world. The problem? I could not find a great community that shared travel stories! Rather than wait for someone else to get this started, I created a community called Amazing Destinations and tapped some of my travel blogger friends to share their content. Within no time people were starting to engage with the community. Now I need to do a better job of keeping up the community and getting more contributors, but it’s a good start. If you run into a similar situation, start your own community! Just make sure that you keep focused on posting good content and get others to participate as well. And if you are interested in travel, please do join amazing destinations. If a tree falls in the woods, does it make a sound? If you post on Google+ and don’t tell anyone, will they ever know? 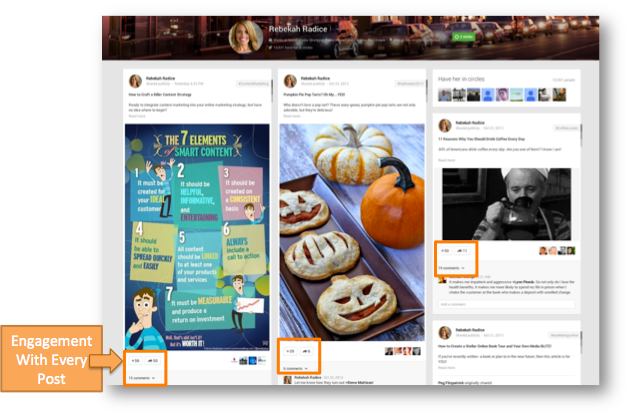 The best method I have seen for getting people to notice your activity in Google+ is to tag them in posts that they would find relevant or where they are mentioned. Simply using the + sign and their name will go a long way toward engagement. 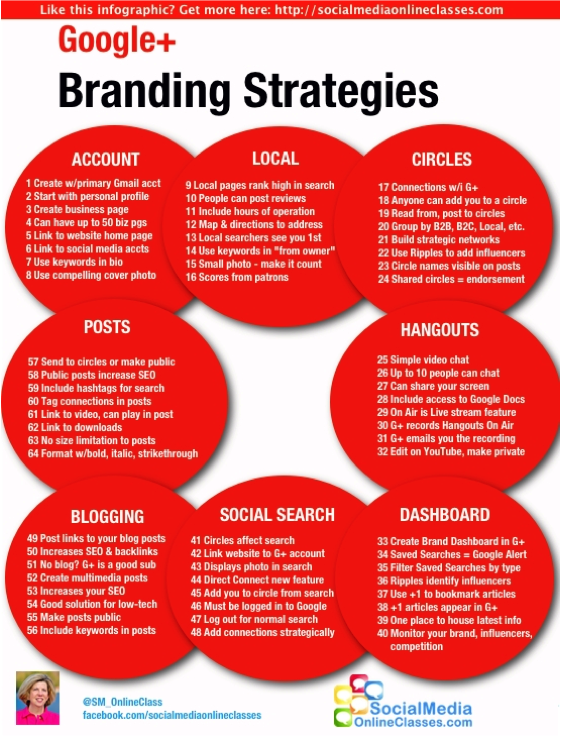 Here are some more Google+ networking strategies to try out from +Mark Traphagen, the most influential marketer I know on Google Plus. Want your friends and followers to know who you find relevant? Create a circle of influencers and then share that circle with everyone. 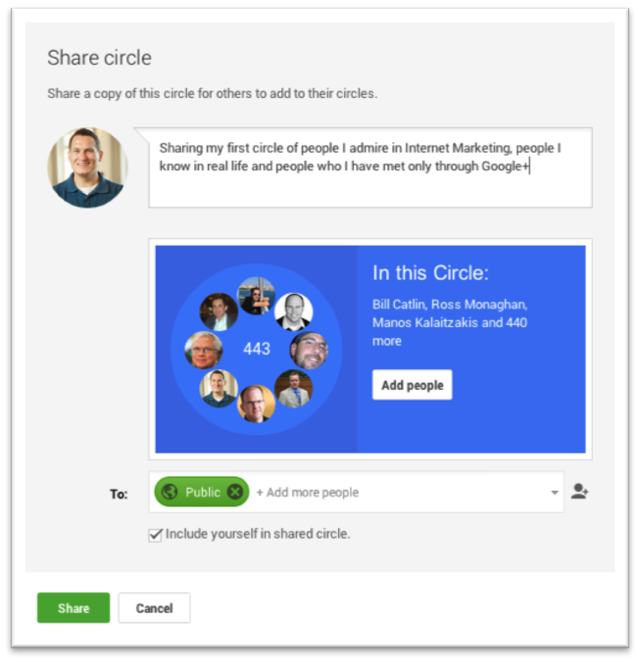 Shared circles are the easiest way to find interesting people on Google Plus, and being included in a shared circle can deliver all kinds of new followers to you. Here is a circle of 440 of my best Google Plus friends that you should absolutely follow. 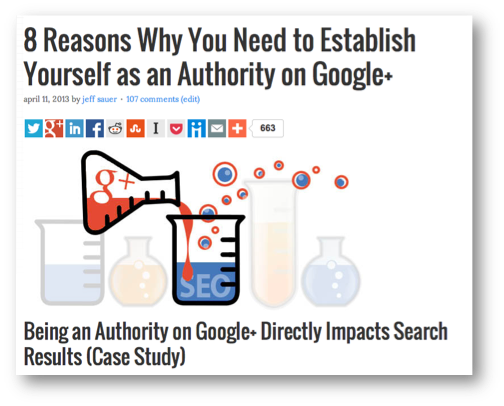 Authorship is one of the original utilities of Google Plus and is what drew me to the network in the first place. 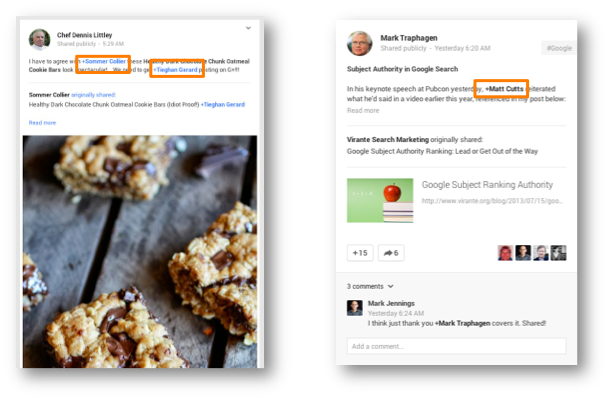 By linking your Google+ profile to websites where you publish content, you can see lend credibility to your search results. 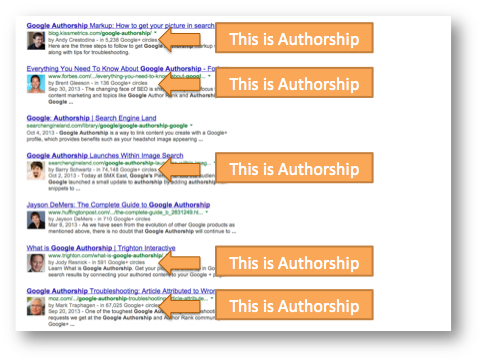 To learn more about marking up your website with Authorship, here is a comprehensive article from Search Engine Land. 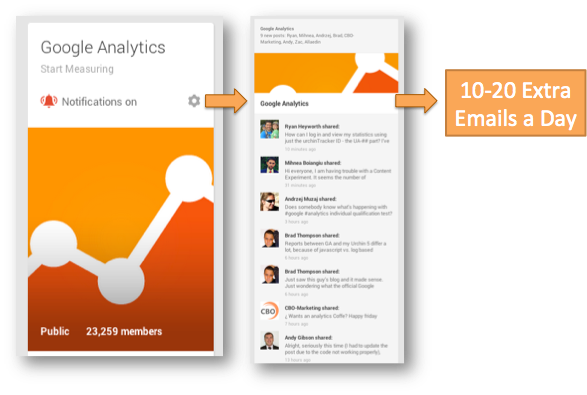 16) Google Plus Impact on Search Rankings? I firmly believe that Google Plus impacts search rankings. While many people agree with me, there are also others who disagree. Those who disagree are not debating the utility that G+ provides to search, but rather debating the direct impact to any one factor. Feel free to read along at home and form your own opinion. Setting goals is one of the most important things that we can do in order to ensure repeated success in our marketing campaigns. In my post called The Ultimate Guide to Measuring Google+ I cover several things that you can measure in Google+ and how to set KPIs for yourself. Much like the post you are reading right now, I provided multiple ways to learn this content, including video, slides and a PDF guide. While I covered these topics again in the Mozinar, I suggest that you read the original post to get the best understanding of what you can measure in Google Plus. Hopefully after reading these examples, viewing the slide deck and watching the webinar you can understand that Google Plus is very important. To me, it is important because it is a social network that encourages engagement between members, allows me to meet new people from all over the world and has numerous marketing benefits. 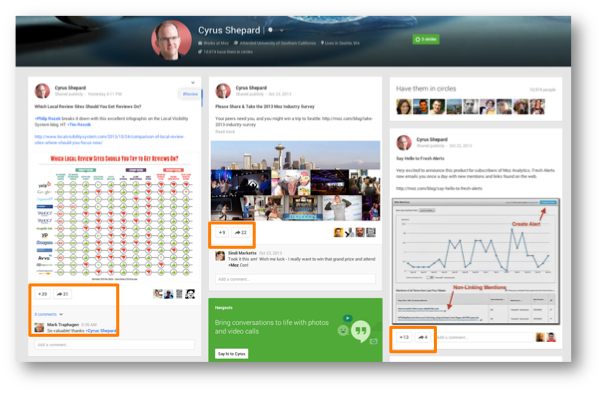 Generally the hardest part about Google Plus engagement is simply getting started. I am hoping that these tips help ease the pain of getting started and get you started on the path to loving Google+! If you are waiting for Google Plus to just go away, I think you will be waiting a long time. Your turn – go and get your learn on! Make sure to follow me at +Jeff Sauer for more tips and sharing.